LAS VEGAS - Nevada Attorney General Adam Paul Laxalt, along with District Attorney Steve Wolfson, and Sheriff Joseph Lombardo announced Friday that court-appointed guardian April Parks and her co-defendants Mark Simmons and Gary Neal Taylor were sentenced in Clark County District Court. Parks was the owner of A Private Professional Guardian, LLC, a business she and her co-defendants used to financially exploit elderly wards they were appointed by the court to serve. Friday's sentencing follows guilty pleas entered into the court by them on Nov. 5, in two cases. In the first case, Parks pleaded guilty to five felony offenses, including two counts of Elder Exploitation, a category “B” felony, two counts of Theft, a category “B” felony, and one count of Perjury, a category “D” felony. Simmons pleaded guilty to one count of Elder Exploitation, one count of Theft, and one count of Perjury. Taylor, who was named in seven counts of the original indictment, pleaded guilty to one count of Elder Exploitation. In this case, the State of Nevada argued in court today for a sentence of 307 to 768 months in prison for Parks. The State sought a 96 to a 240-months prison sentence for Simmons. Taylor’s plea agreement jointly recommends a sentence of 24-60 months in prison. In a second related case, Parks, Simmons and Park’s attorney, Noel Palmer Simpson, pleaded guilty to exploiting an elderly couple through the use of guardianship between Dec. 2010 and May 2017. In this case, Parks, Simmons, and Simpson each pleaded guilty to another count of Elder Exploitation, a category “B” felony. The State argued for 96-240 months in prison for Parks and Simmons. James Thomas Melton, the remaining defendant in this case, is scheduled to stand trial on February 25, 2019. In the first case, Eighth Judicial District Court Judge Tierra Jones sentenced Parks to 192-480 months in Nevada state prison. Simmons received a sentence of 84-216 months for his role in the scheme, and Taylor was sentenced to 24 to 60 months. In the second case, Parks was sentenced to 72-180 months and Simmons was sentenced to 48-120 months, to be run concurrent to their first sentencing orders. The judge also ordered that the defendants pay restitution in the amount of $559,205.32. Simpson’s sentencing date was continued by the court. Parks, Simmons, and Taylor have been in custody since March 2017. Both cases were jointly investigated by the Office of the Nevada Attorney General and the Las Vegas Metropolitan Police Department. Prosecutors from the Office of the Nevada Attorney General and Clark County District Attorney’s Office prosecuted this case. Metro Police are investigating a shooting in the northwest valley Monday morning. The shooting occurred in the 8500 block of Honey Vine Avenue, near Durango Drive and Racel Street. 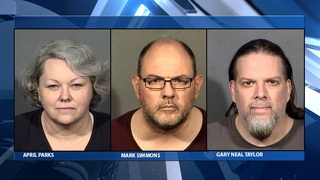 Police were called to the home around 8 a.m.
LAS VEGAS (KLAS) -- Five members of the same family are due in court Monday morning. They are facing charges in the accidental shooting of a young boy. Metro Police say the 3-year-old accidentally got ahold of his mother's gun and shot himself in the head. This happened in November. The boy is on the road to recovery now but five of his family members are facing a long list of charges. Earlier this month, police arrested the boy's parents, Liza and Richard Haut, his grandparents, Marvin and Rackell Haut and his uncle Joshua Haut. They all lived at the same home in North Las Vegas. LAS VEGAS (AP) -- After winning Game 5 at home to avoid elimination, Tomas Hertl vowed the San Jose Sharks would return to SAP Center for a seventh and decisive game in their opening round series with the Vegas Golden Knights. One day later, he clarified it wasn’t necessarily a guarantee, but rather a vote of confidence his team would force a Game 7. 8 News Now at 6:30 p.m.